Upbeat jazz and ragtime-influenced music filled the cavernous main room of the Bosnia-Herzegovina armed forces’ Army Hall in downtown Sarajevo as Maryland National Guard and Bosnian armed forces members came together to celebrate 15 years of partnership in the U.S. Department of Defense’s State Partnership Program. The SPP pairs National Guard elements with partner nations worldwide. Begun in 1993, the program has grown to include 75 partnerships with 81 countries. For many, the effects of the partnership with Bosnia-Herzegovina can be seen in the way it’s grown over the past decade and a half, beginning with small training events and expanding to see Bosnian armed forces members deploy alongside Maryland Guard units to Afghanistan. “In my opinion, the crown of this 15 years of cooperation was the joint deployment of the military police unit from the armed forces of Bosnia and Herzegovina and the Maryland National Guard to the mission in Afghanistan,” said Bosnia-Herzegovina army Lt. Gen. Senad Masovic, the chief of the joint staff of the Bosnia-Herzegovina armed forces. For others, the most rewarding part has simply been seeing the growth itself. Singh, Birckhead and other Maryland Guard senior leaders recently spent time in Bosnia-Herzegovina, both as part of celebrations marking the 15-year anniversary, but also to map out future plans for the partnership. Those plans include expanding noncommissioned officer leadership training, disaster response training as well as boosting cyber capabilities. That forum and focus on cyber also means first asking what cyber capabilities means for the Bosnia-Herzegovina armed forces, said Singh. “What cyber means for us might be slightly different from what cyber means for Bosnia and Herzegovina,” she said, adding that working with the Bosnia-Herzegovina armed forces to build greater cyber capabilities also brings larger effects. “This will help to put Bosnia and Herzegovina in the lead for the region and for us to be looking at regional cyber security cooperation,” said Singh. Future plans also include possibly expanding aviation capabilities and training. 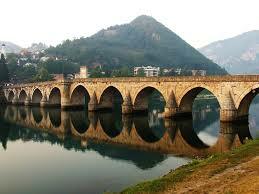 Vogel added that one thing she’s looking into while in Bosnia-Herzegovina is how that imbalance could change. That may include roles on the ground as well as in the air. The larger goal, said Vogel, is simply learning from each other. Developing those relationships also means continued tri-lateral training exercises with the Estonian armed forces, also partnered with the Maryland Guard and one of the three original partnerships in the SPP. Doing so expands interoperability between partners. “If we are going to strengthen our abilities, then we have to do them together,” said Singh, adding that working together builds larger, intangible skills and abilities. Those personal connections have been made over the past 15 years, said Singh, who sees those connections growing stronger over the next 15 years and more. “The fact that we’ve made it 15 years and we’re continuing to see progress and talking about 20 and 30 years, that shows a significant commitment to each other and to doing the right thing for our services,” said Vogel. For Vogel, that, in part, made the 15-year celebrations at Army Hall, and the continued partnership, something noteworthy. “This trip in particular was really special, but in general it makes me feel like I’m part of something really cool,” she said.